Opposition Leader Tshering Tobgay keeps a blog, of course everybody knows it, but I knew it somewhere in May this year. I had 12 blogs since 2006, and never thought I would go crazy over them some day. 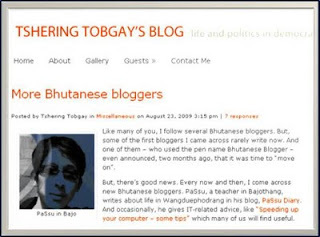 Only when I started reading Tshering Tobgay's blog regularly I came to know that there are lots of Bhutanese blogger. Some of them were featured on his blogs ever since. When you read my blog you will see that only this year I have taken it seriously. All thanks to the man. He has great duties to fulfill for our country yet I am amazed by his thoughtfulness in taking time out and inspiring us by featuring new comers and not-so-common blogger on his widely-read blog. This time it's me with some friends and I am humbled when I saw my picture there. Thank you so much for motivating me. I will make your effort worthwhile. I had a really great time reading this kind of valuable post. Please keep sharing and enlightening your readers' minds. Visit my page at www.lawrencetoddmaxwell.net when you have some spare time.